So here we go with the first for many (hopefully) posts on the recipes we have enjoyed at TheSecretGarden-France. We have been trying a few ideas and decided that this was a winner, and it was fun, there is not a lot of cooking to be fair but the results were fantastic. The building blocks for this recipe start with the lemon curd , I don’t know about you, but I like to search for ‘the ultimate recipe’ that JUST feels right. I often search for ‘THE’ recipe and I have worked with this recipe a couple of times and I think it hits the mark every time. I have made it for guests at TheSecretGarden-France and they were very impressed. So I thought I would share with you and you can try and see what you think. There is not a lot of cooking to this, to be honest it is only the lemon curd and the Italian Meringue that needs to be cooked so if you don’t want to tackle making your own lemon curd, then there is nothing wrong with buy a good shop bought lemon curd and using it. I have made my own lemon curd for this recipe. I also use an Italian meringue as it is ‘cooked’ with the syrup, but if you don’t want to make an Italian Meringue, then you can make a French Meringue (no cooking), both look fantastic, it is just your preference. 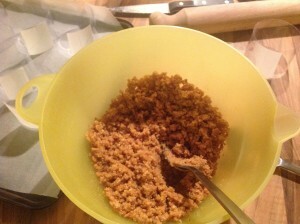 Mix the crushed biscuits and melted butter together in a bowl until well combined, then place a good amount into each of your rings, and pat down to make sure you have a good base of the cheese cakes, I found the end of a rolling pin was good for getting into the rings and round the edges, alternatively use a spoon. Put the bases in the fridge while you make the lemon cheese. In a large bowl, mix the cream cheese and icing sugar with the lemon curd, this can be done with a hand mixer, then fold in the whipped cream using a large metal spoon, you are trying to make sure you keep the mixture light and airy, if you beat with the mixer you are likely to knock the air out of the cream. Using a knife or spatula, smooth the top of the rings, giving a nice base of the meringue to be added later, it doesn’t need to be perfect as it will be covered with the meringue later. 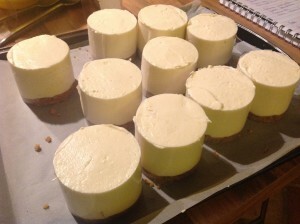 Place the lemon cheese cakes in the fridge to set for 2-3 hours, they can be made to this point the day before. 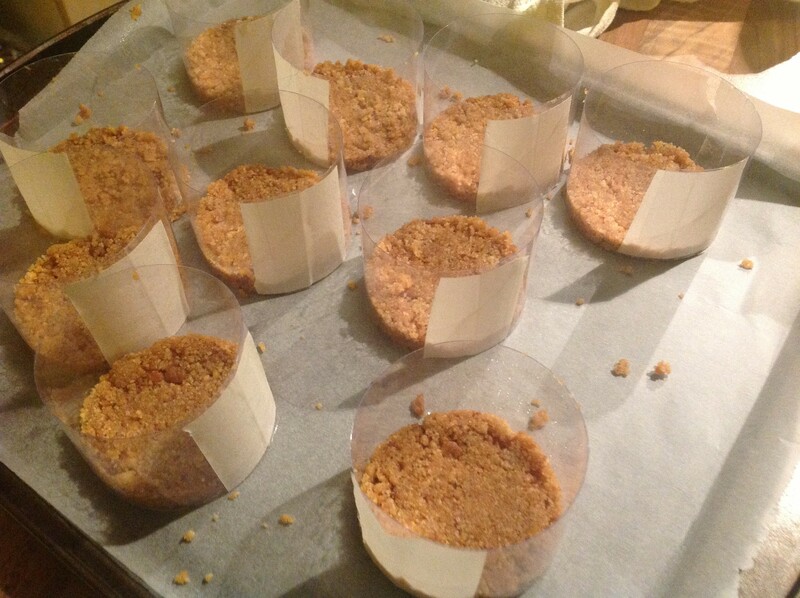 When you are ready to top with the Italian meringue, take the lemon cheese cakes out of the fridge and remove the rings, either use a sharp knife and go round the sides of your ring or a blowtorch just to heat the sides and this should help the lemon cheese cakes to slide out cleanly. Place the lemon cheese cakes on a plate, put the Italian Meringue mixture into a piping bag (oops forgot the picture at this point) and top the Lemon Cheese Cakes with the Italian Meringue, you can use any nozzle to pipe the meringue, if you don’t have a piping bag, just spoon the meringue mixture on top of the lemon cheesecakes and make any pattern you fancy. 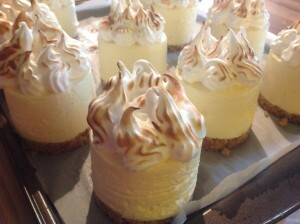 Then using a blow torch, scorch the meringue to add to the look of the Lemon Meringue Cheese Cake and Ta Dah, you have your Individual Lemon Meringue Cheese Cakes. 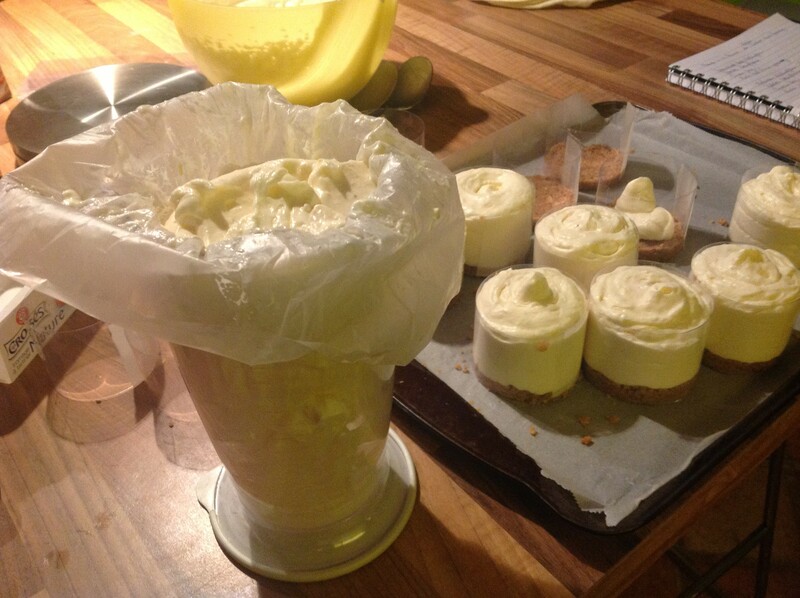 I hope you enjoy your Lemon Meringue cheese cakes.